To order a printed copy of the Clearview Stoves catalogue, simply click the Request button below. 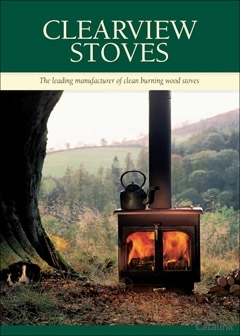 Clearview Stoves are the UK's leading manufactures of exceptional woodburning stoves, considered by many to be the finest in the world. Since 1987 their skilled workers have been producing a range of highly efficient, simple to use stoves, that provide wonderful views of the flames behind glass that remains crystal clear. There are eight stoves available in six colours and various styles to suit all situations from the modern to the traditional. The company care's passionately about the environment and believes wood is the perfect fuel. Trees provide food and shelter for wildlife, add beauty to our lives, and then provide us a near carbon neutral fuel for our heating. A wood fire radiates a feeling of well being, the flicker of flames making it a magical place to relax plus wood enables you to take control of your heating, never again worrying about power failures or the rising cost of oil. By pressing the Request Printed Catalogue button you give consent to Clearview Stoves (and their Data Processors for the specific purpose of delivering your literature) to send you their Catalogue.